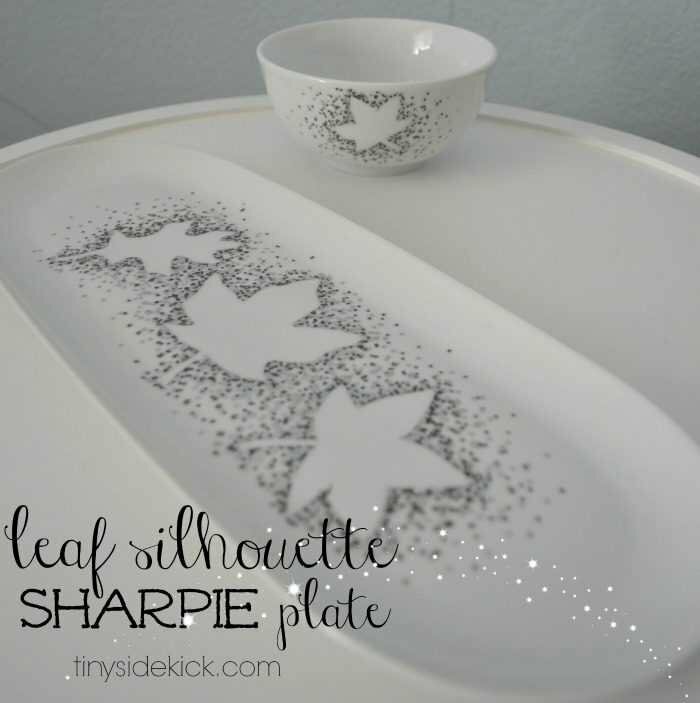 Inside: Fall Leaf Sharpie Plate would make a perfect hostess gift or plate for appetizers. Full tutorial and tips to help you make one too! I love this time of year because it means having lots of friends and family over to celebrate the season. Every year I struggle with the idea of buying such season specific serving dishes because they can be pricey. But I saw a plate in a catalogue that I couldn’t get out of my head and had to come up with a way to avoid spending almost $60 on it. And so this fall leaf Sharpie plate was born and although it turned out a little bit differently than I had envisioned, I love the result. Plus my cost for this plate and bowl was about $15. Boo-ya! You will need an oven safe ceramic serving piece, metallic Sharpies, (silver seemed to work the best), contact paper, white paper, a pencil, scissors, and an oven. First you will need to decide on a design. I chose fall leaves for a few reasons. One, I think that I could get by using the leaf motif for both fall and winter (remember my fear of too seasonally specific stuff) and two, they are a simple silhouette with not a lot of detail which is perfect for this project. Then do a quick Google search for “fall leaf silhouette.” There are a ton to pick from. Try to find ones you like that don’t have a lot of jagged edges. This will make your job easier later. I made them the size I wanted (based on the size of my plate and bowl) by zooming in; then I simply laid white paper over them and traced lightly with a pencil (much like I did for my Jar Silhouette Art). Tape each leaf to the white side of some contact paper and cut it out so that you now have a sticker in the shape of that leaf, which will be your stencil. Decide where you want to place your leaves onto your plate and stick them there by peeling off the back side of the contact paper. Be sure that they are securely stuck with no air bubbles, especially around the edges. Now you’re ready to get polka-dotting! So, before I started this project, I did some reading about how this whole Sharpie mug and plate thing really works. From what I read, oil based Sharpies work best, black and metallic Sharpies come in second, and using a coating at the end is ideal. All of it won’t last forever if you plan to wash it, and it should be hand washed. So for my seasonal use of this, I used metallic Sharpies with a clear coat and I plan to hand wash it. Ok. Back to the polka-dotting. You will be doing many layers of dots. I started with one color and did some larger dots all around my leaves, focusing on the edges. I added another layer of larger dots with each color: silver, gold, and copper. Then I went back with each color and added dots by just dotting all over, making sure that lots of dots are at the edges of the leaves. So many in fact that you couldn’t see the white on the line where the contact paper and plate met. Think ombre here, people. The dots will be heavy at the edge of the leaves and fade out. When you are satisfied with your dotting, let it dry and then peel off your contact paper leaves. (I repeated these steps for the bowl too). Place your plate into a cold oven and set it to 350 degrees. Once it hits 350 degrees, bake for 30 minutes and then let it cool in the oven too. I opened my oven a little bit to help it cool. I made two of these and sprayed one with Acrylic Sealing Spray after letting it sit overnight (I used Krylon moisture resistant clear spray**). Because I was concerned that the spray is not food safe, I didn’t spray the second one and after washing both by hand, they looked exactly the same. So if you plan to use your dish, I would consider not spraying. If however it is purely decorative, spray away! And here is the result! If you love it, be sure to pin it by hovering over the image! When I said at the beginning of the post it didn’t turn out exactly as I had imagined, I was referring to the colors. The gold and copper didn’t look as shiny as I thought they would. Still, I love the result and actually like how subtle the colors are. It makes it a bit more modern…and a bit more my style. So now I’m ready to serve some appetizers with a little dip on the side all season long! This is just one of 5 awesome projects for you today… so click through the list below to get inspired by some more great bloggers and don’t forget to pin the projects along the way! I wonder if trying this on the bottom side of a clear platter would allow for use with food? Love this! I was planning to do this to my bowls soon because I’m sick of how boring they are and have just been looking forward to every time one gets dropped (that much closer to buying new dishes!) Will definitely be doing this this week. Thanks for sharing! Haha! That is funny. It makes it easier to justify getting new ones if you run out right? This would be a great way to jazz them up! Thank you Brenda! It was my first Sharpie project attempt and now I think I’m hooked! The possibilities are endless. Thanks for stopping by! I love them! That would make a great Christmas gift. That is so cute! I love it….really original. I’m pinning it to our board. Thanks for linking up to the Twirl and Take a Bow Party! Hope to see you again next Tuesday! I hope you are as excited as we are! Please feel free to contact me at your earliest convenience. Since I’m working under a rather tight deadline, your timely response would be greatly appreciated! If you decide to co-host, I’d need your 3 preferred methods you’d like blog hop participants to follow you and the URL of the post you’d like to link up this week. I love how this turned out, Corey! This plate would make an awesome Christmas present! I’m so glad you shared this at Frugal Crafty Home Blog Hop! I hope we see you back on Sunday night! What a great idea! I love that you can use different colors of the sharpies to bring out different aspects of the design. Glad you posted at the Brag About IT link party. I’ve pinned, liked, twittered and G+-ed your post. I’d love it if you dropped by for a visit at http://www.kneadedcreations.com . I look forward to seeing you over there! Deb @ Kneaded Creations. I’m really loving this idea! I don’t bother buying the fancy “holiday specific” dishes either, but it would be nice to have something cute that matches my personal style. Great job! They look amazing! Ooh, these are so cute! Love the sharpie plate. And thanks for visiting Mabey She Made It! Geeze I got behind on replying. I did get to the party though. Thanks for the invite! Thanks Melissa. I did link up. Thanks for the invite! I really love the scatter effect – the reverse design is so fun and modern. Awesome project and great tips Corey. Pinning. Lovely, and thanks for the “sharpie on china” tips, I have been wondering how well they last/the best way to go about it. Perfect for jazzing up something for a special occasion without having to spend a lot. This is absolutely gorgeous. I love the design! I am curious about how it is food safe though. Is the acrylic spray you used specifically designed to make it food safe? I know that I haven’t done as many sharpie projects in the past as I wanted to because of this issue and the food safe porcelain markets can be hard to find. Hi Maggie! Ya know…I thought about the same thing and actually made 2 of these at the same time. (I was planning to give one as a gift.) But when it came to the spray, I only sprayed one of them. After washing both by hand, they look the same. So if you are going to use the dish, I wouldn’t bother spraying. As for the actual Sharpie, not really sure, but again, this is a plate I am only using once in awhile. I updated my post to reflect my findings. Thanks for stopping by! Love this! So beautiful and classy! I’m sure your guests will love them as well. And you can’t beat the price! Hope you’re having a great day, Corey! I love this project! The platter turned out awesome. Bummer about the gold and copper not quite working out, but it looks great regardless. I just did a similar project with mugs and used regular old black sharpie, baking at 375F… I did a test in the dishwasher and surprisingly, no harm! I didn’t hear about adding that last step of sealer. I might add that just to be safe. Thanks for sharing! Thanks Amy. I was so nervous to try this project, but now I can’t help but think what else I can put onto plates and bowls and mugs. What a great idea! I love the silhouette look, super classy 🙂 Gorgeous!